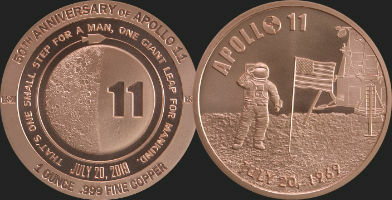 Celebrating this momentous historical event, Golden State Mint is very proud to offer this design of the Apollo 11 50th Anniversary 1 oz round offered in Copper and Silver Bullion rounds as well as a special Limited Edition Silver Proof 1 oz round which are individually serial numbered. All three offerings are .999 fine and crafted with high quality with both the visual and artistic appeal as well as the quality of the metal and manufacturing in mind. As this is a GSM product, there is no middle-man and you can rest assured every product is made by us and is shipped Mint Fresh Direct to You. Do not miss your chance to get this design for your collection now! This will be a limited time offering in both BU and Proof. 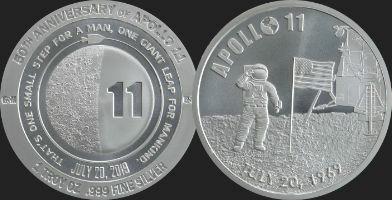 The Proof will be limited to 5,000 total with the count being individually serialized and etched on the edge of the round and shipped in a capsule and black leatherette box. 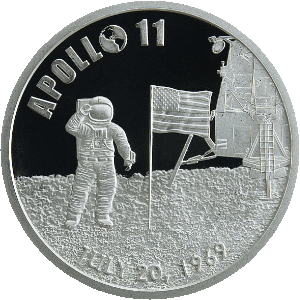 At Golden State Mint we are always striving to improve our product to provide you with the best quality in Gold, Silver and copper bullion as well as continually creating new and interesting designs and offerings. 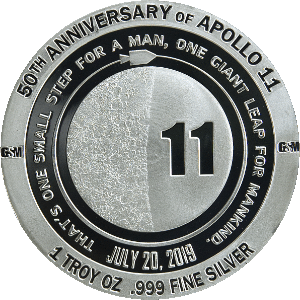 The design for this Anniversary piece was inspired by many elements including photos of the landing, artwork used in the Apollo 11 Flight book and materials as well as the unforgettable and even highly debated quote by Neil Armstrong.